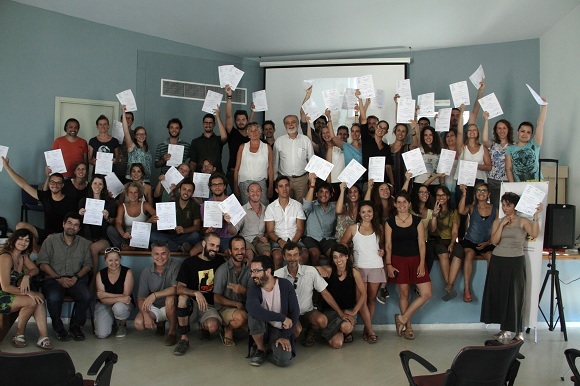 Some 70 post graduate students from 21 countries had the opportunity to participate in the Summer University of Samothrace 2016 that was successfully organized on the island of Samothrace in Greece from 9-22 July 2016. The summer university consisted of two parallel courses focusing on ‘Aquatic and Social Ecology-Theory and Practice’ (Course A) and on ‘Integrated Water and Coastal Management – Educational and Participatory Approaches (Course B). Course B brought together 31 participants from 14 countries, namely Bosnia & Herzegovina, Belgium, Bulgaria, Cyprus, Ecuador, Greece, Italy, the Former Yugoslav Republic of Macedonia, Poland, Slovakia, Slovenia, Spain, Sweden and Turkey. It was led by MIO-ECSDE and the UNESCO Chair and Network of UoA with the support of GWP and the UNESCO Regional Bureau for Science and Culture in Europe Venice. In a nutshell this course addressed the following topics: Integrative Methodological Framework for coastal river basin and aquifer management (IMF); the Integrative Water Resources Management Approaches (IWRM), part of the GWP Toolbox; Biosphere Reserves (characteristics, function, governance, etc. ); public and stakeholder participation (stakeholders identification, mapping and analysis, surveys); nature interpretation (in the field); modeling and simulation of dynamic systems; place-conscious learning & place-based educational pedagogy; marine litter collection & recording.Throughout the training the participants worked on a group assignment to develop recommendations for the sustainable management and development of Samothrace, having as a reference point two main documents: i) the Samothrace Nomination folder to the UNESCO/MAB Biosphere Reserves Programme; ii) the IMF methodology; combining also all their findings throughout the course of the summer university. The trainees presented their findings on the last day of the 2-week long Summer University. The main aim of the Summer University was to deepen the understanding of the value of Biosphere Reserves, as “laboratories” and “catalysts” of Sustainable Development. 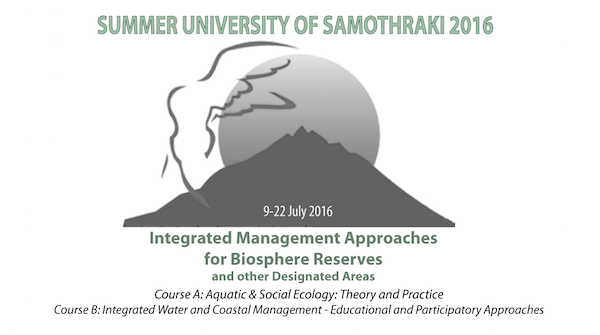 The Summer University specifically aimed to highlight the rich natural and cultural diversity and heritage of Samothrace and support the proposal for its inclusion in the World Network of Biosphere Reserves (UNESCO Man and the Biosphere Programme, MAB/UNESCO).